Many of us have mixed feelings about James Franco. He was so adorably spacey in Freaks and Geeks, so mainstream in Spider-man, so solid in Milk, and so unbearably pretentious pretty much everywhere else. When it gets to be too much, just do what I do and watch him squirm in 127 Hours. Franco recently seems to be indulging himself in a series of personal projects—a bizarre and apparently ironic gig on General Hospital and the film Erased James Franco in which he acts out all parts of scenes from his past films—and his latest effort, Maladies, seems to fall in line with his recent pattern of offbeat, somewhat indulgent choices. A collaboration with one-name writer/director Carter (who also brought Erased James Franco to life), Maladies stars Franco as (who else) James, a soap opera actor turned writer trying to embark upon a career as a novelist. 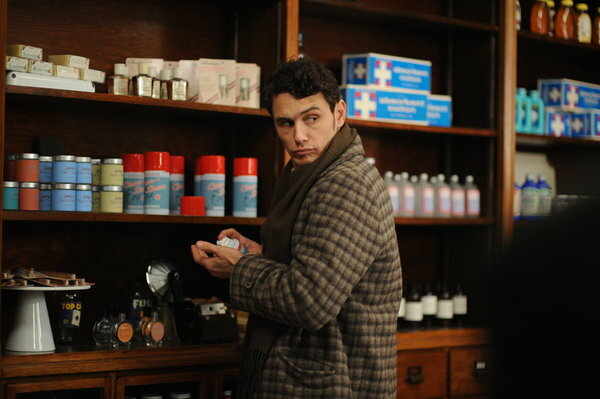 Playing what appears to be a 1960s-era fictionalized version of himself, Franco-as-James is a “tortured, infantile artist, obsessed with creation and death” who suffers from an unidentified mental illness, and is surrounded by a handful of similarly eccentric characters (skillfully portrayed by Fallon Goodson, Catherine Keener, and David Strathairn) and a narrator that only he can hear. Through its chaotic structure and unconventional characters, Carter uses Maladies to question the relationship between creativity and mental illness and what it means to define someone as mentally ill – even going so far as to suggest that mental illness is “really all in our heads” (pun intended? ).